Published and created by Curve Digital. Titan Attacks! 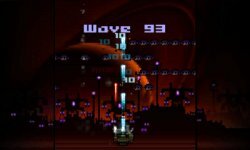 is a modern Space Invaders with 100 stages, an online leaderboard, and a weapon upgrade system. 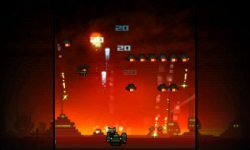 Just like in the Taito classic from 1978 you just move your defense tank left and right at the bottom of the screen and shoot aliens from the sky that try to reach the earth. Even the bonus UFO is intact! But of course there's more to it than that. Every stage is different: New alien races appear with better shields, different attacks and movement patterns, bringing in touches of Galaga, Robotron, Centipede and other retro classics. If you aim well enough you can rack up combos and get more points and money. Aliens might even leave their destroyed ship and float to the surface. You can collect them for extra money or shoot them, but don't let them reach the ground or they'll steal some money. Between every stage you can spend your money in a shop: purchase stronger weapons, shields, more shots, smart bombs, and other upgrades, or just save your money for the next round. Strategic purchases make your life easier, especially for the bosses that appear every 20 stages. Defeating a boss unlocks a new planet in the level select screen, a permanent savepoint from where you can start out when you're game over. In my opinion the developers could have added more of these checkpoints, but fortunately you can create a restore point (save&exit) in the pause menu at any time. Once all your shield is gone and you get hit it's game over and your name and score is added to the online leaderboards (global and friends). Though if you aren't connected to the internet there'll be pop-up error messages. Under this circumstance the game "crashed" twice during the test phase and went back to the 3DS main menu automatically. The simple gameplay is addicting though, but it's not very smooth when the whole screen is cluttered with enemies. It seems the game decides to take away one or two of your multiple shots upgrades temporary to keep the framerate intact. The graphics are decidedly retro but nice enough for this kind of game (even though it's not fullscreen and has those obligatory arcade borders on the sides). However, it's missing the stereoscopic 3D feature of the Nintendo 3DS completely. That's pretty sad considering the beauty of 2D games in 3D. Another disappointment is the music that is nothing to write home about: the same track looping all the time and just a few short uninspiring short tracks for the menus. Overall the presentation is lacking, especially for the relatively high price. 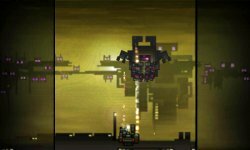 As a big fan of Curve Studios releases on Nintendo platforms (Hydroventure was my favourite WiiWare game of 2010 and received a 10/10, and Stealth Inc. 2 was my favourite Wii U eShop game in 2014 and received a 9/10) there's a bit of disappointment regarding Titan Attacks! I thought the gameplay and content is a solid 7/10, but the boring soundtrack, no 3D, lag, error messages and crashes when playing offline, and the price (compared to other eShop games in the genre, and even Curve's own outstanding catalog), is enough to bring it down a point. Thanks for reviewing this game @SKTTR! A 6/10 is just about right for this game! I thought that this game was more like Galaga than Space Invaders!